Download this free Bootstrap 4 Business Template to craft an amazing website for your company, digital agency, web design firms, and software company. 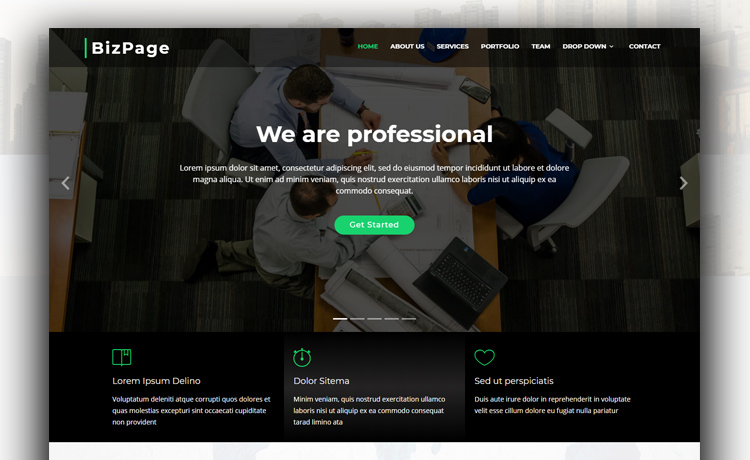 BizPage is a free Bootstrap 4 business template with clean code, visually appealing design and malleable one page layout. This website template is a boon for the creation of a business site easily and seamlessly. Bootstrap 4 and HTML 5 are the two latest technology implemented in the web trend for recent years. And BizPage was successfully built with these and other eminent technology. The free version of this one page Bootstrap template is a recommended one if someone needs something reliable to work with. BizPage applies to the modern and corporate websites. Especially, business, agency, design firms, advisors, consultants and similar kind of fields are the best fit. Also, one can take this free HTML5 website template for a software company or any other business homepage. If you’re a beginner developer, the level of your coding knowledge must not contradict the code structure of BizPage since it provides well-organized and distinguished section-specified markup. Additionally, we have checked the Cross Browser Compatibility, and the result satisfied us on the latest Chrome, Firefox, and Edge. Also, it will run on the other less popular browsers and older versions of the ones mentioned above. Not only BizPage Bootstrap business template is for exuberant people, but it also added off-canvas navigation on mobile screens and other compelling options to stay up-to-date with the current trend. As it’s a responsive HTML template, the drop-down menu, as well as other sections, work precisely on the mobile devices, too. Moreover, the portfolio is a noteworthy section which holds the design with lightbox support and sortable option. Then there are two carousels for testimonial and clients logos: those two will help your audience to trust the services your offer. Moreover, this starter website template could be beneficial for a start-up or business enterprise. With the BizPage bootstrap theme, your opportunities to be awesome are limitless. By utilizing the 14 sections to tell in detail about the company and services, it’s easily attainable the business goal. Furthermore, the smooth scrolling, parallax, working contact form, call to action, and service section: you have got the right ground to promote and get benefited. To quench your thirst for more staggering website templates, please visit our site. We can suggest you a high-end Bootstrap template – Elixir, one of our painstakingly built premium templates for corporate, business, and agency. Really attractive design and amazing template and easy to understand and customize. Thank You Theme Wagon Loved it !! The UI is so attractive !!! like it. Can't believe it's a free template. Thanks team. I love using it. Thank you theme wagon. Licence type? can i use this for further use like selling without giving any credit link? Licence please? Can i sell it, without giving any credit links? Can i use this template for my business website? for free??? hello I downloaded this template but I made a lot of changingon it is there any problem if I put my name in the footer section?? We downloaded and checked the free version of Safari. Sorry to say we don’t give support on free templates made by others. You have to do that yourself. Thank you for downloading anyway. Why can’t you be sure? Author’s name available on the right side of the template description. Besides, I told you it’s a third party template which means we didn’t develop it. I appreciate your visit though. You’re always welcome. Thanks. Keep in touch for more awesome works.